https://doc.wikimedia.org/ hosts documentation and coverage report for several softwares. It is currently hosted on contint1001.wikimedia.org which also hosts Jenkins, Zuul and Docker for the deployment pipeline. The content is generated by CI jobs on WMCS instances which rsync the artifacts to a proxy instance on WMCS: integration-publishing02. 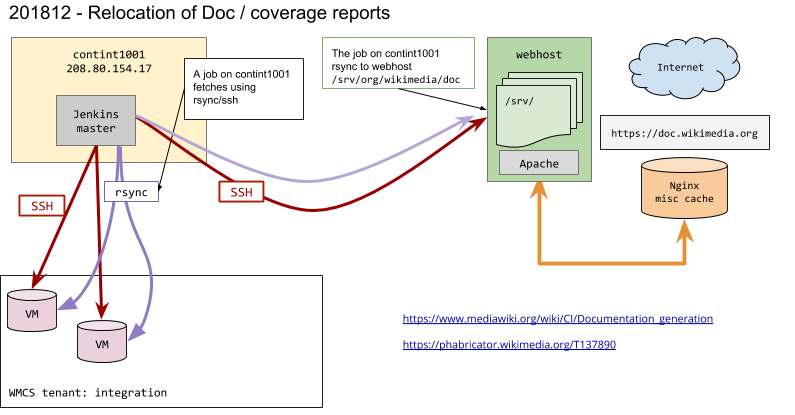 A job is then triggered on contint1001 to fetch the artifacts and copy them to Apache docroot effectively publishing them. although content is code-review +2 by project owners, the code is running on a production machine that has jenkins/zuul/docker which might be a security breach. It seems safer to have the code executed on a different machine. whenever the CI machine is under maintenance, doc.wikimedia.org is no more available. contint1001.wikimedia.org /srv/org/wikimedia/doc occupies 32GBytes. I have requested 150GBytes to accomodate for the operating system and potential future growth. 4CPU/4GBytes RAM sounds sufficient. There is not that many server side activities to be expected. Most of the content are static files. We need it to be Stretch to get php7.0. If at all possible, I would like the instance to be fairly isolated from the rest of the network (prevent outgress). We would need bacula backup. hashar renamed this task from eqiad: 1 VM %request for doc.wikimedia.org to eqiad: 1 VM request for doc.wikimedia.org. Dzahn moved this task from Backlog to Doing on the serviceops board. [operations/dns@master] add IPv6 records for doc1001.eqiad.wmnet. He rsynced the entire data from contint1001 with rsync -avp /srv/org/wikimedia/doc/ rsync://doc1001.eqiad.wmnet/doc. The VM is working and the basic service is there ( rsyncd ). I will complete the service implementation via the parent task T137890. Yes, the VM has been created, basic role has been created, users added, httpd installed, data rsynced .. and per Hashar in T211974#4834808 i am going to call this part resolved here and also continue on ---> T137890.